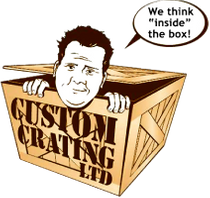 Custom Crating Ltd provides customized crating and packaging services in the Edmonton, Alberta, area to meet all your domestic and international shipping needs. We’ve been in business for 25 years in Edmonton and are specialists in shipping oil, gas and electronic equipment and materials, as well as a wide range of other products for all types of industries. Please contact us to learn more about how we can help with your logistical demands or to schedule service.